Step off the beach and step back in time. Set on 39 pristine acres along the Currituck Sound in Historic Corolla, the Whalehead is a beautifully restored 1920s-era Art Nouveau-style mansion listed on the National Register of Historic Places. 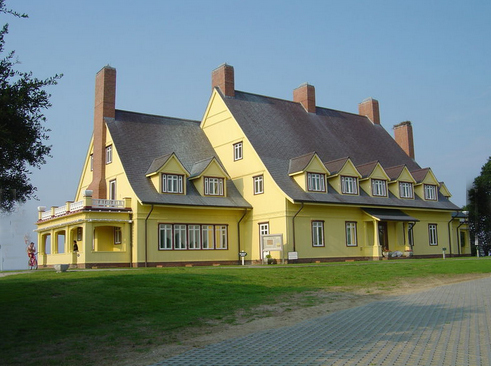 With its bold yellow paint, copper roof, and mahogany doors, the Whalehead invites you to explore a fascinating period in Outer Banks history. Nearly every inch of the home has been carefully restored to the way it looked when Edward Collings Knight Jr. and his wife, Marie Louise, first opened the doors as a lavish hunting retreat in 1925. The wealthy Knights spent their winters here hunting, relaxing and entertaining. Today, stepping inside is to step back into another time and place. Restored in 1992 to its original glory, the Whalehead is now open year-round for tours.